Former Minnesota Timberwolves forward Kevin Love. The Cleveland Cavaliers are set up to be really good. Cleveland will acquire Kevin Love from the Minnesota Timberwolves in exchange for Andrew Wiggins and Anthony Bennett, the No. 1 overall picks in the past two NBA drafts, according to Yahoo Sports’ Adrian Wojnarowski. The trade had been anticipated even before LeBron James announced he would return to Cleveland. In fact, we had already run a projection of what the Cavs would look like with James and Love on the roster. That projection pegged them for a 63-19 record. But our hypothetical roster had imagined Cleveland would give up its starting center, Anderson Varejao, in the Love deal — and the team’s reportedly managed to keep him. That will considerably bolster its front-court depth. I’ve also rerun the projection based on NBA Real Plus Minus (RPM) instead of Statistical Plus Minus (SPM). My colleague Neil Paine and I are due to provide you with an overview of these various systems and their strengths and weaknesses — but the gist is that RPM is based on play-by-play data instead of box-score data and can better account for a player’s defense. 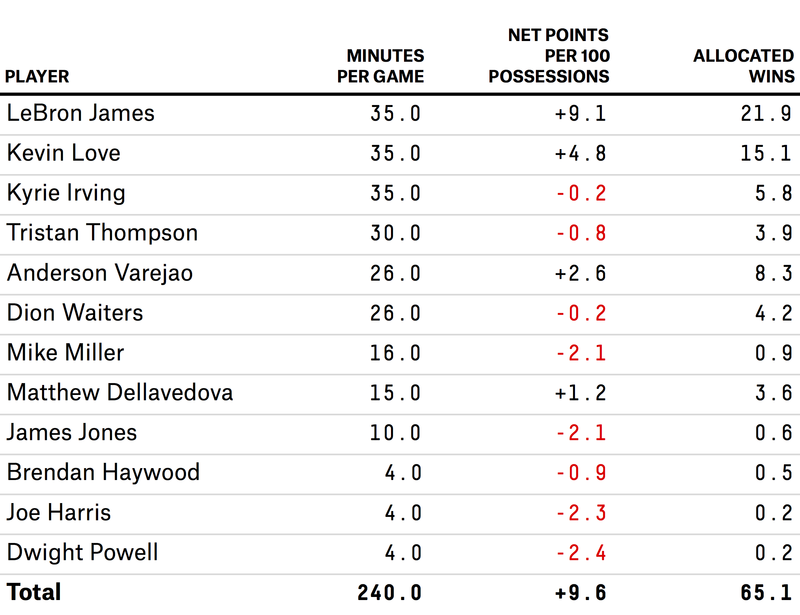 Compared with SPM, RPM is higher on James and Varejao — strong defensive players — but less keen on Love. It’s also down on Kyrie Irving, the Cavs’ starting point guard, because it rates him as playing poor defense. Still, Cavaliers fans will be pleased with the new projection: a 65-17 record. That figure reflects an over-under line. I might take the under if offered it by Vegas for a couple of reasons. One, the projection assumes the Cavaliers stay relatively healthy, and there’s no guarantee of that. Second, the Cavaliers are so clearly ahead of anyone else in the Eastern Conference — especially with the injury to Indiana’s Paul George — that they might rest their stars or coast down the stretch. That could help them in the playoffs, where rest matters quite a bit, but could shave a couple of wins off their regular-season record. In addition, there’s always uncertainty about how high-volume scorers like James, Love and Irving will mesh together, and it may take Cleveland the better part of the season to figure out how to distribute possessions. A lot of statistical projections overrated the Miami Heat’s regular-season win total for the 2010-11 season, their first year with James, Dwyane Wade and Chris Bosh. But there’s also a case our projection for Cavs is too pessimistic. The case turns on Irving improving his defense. Irving is a good athlete, and with James mentoring him and a championship to play for, his results on the defensive end could improve. The same holds for other young Cavaliers, such as Dion Waiters and Tristan Thompson, which RPM also rates as poor defenders. Either way, the trade should make Cleveland a championship contender. Before adding Love, it projected to a win total in the low-to-mid 50s. A team like that will win the NBA title less than 5 percent of the time. 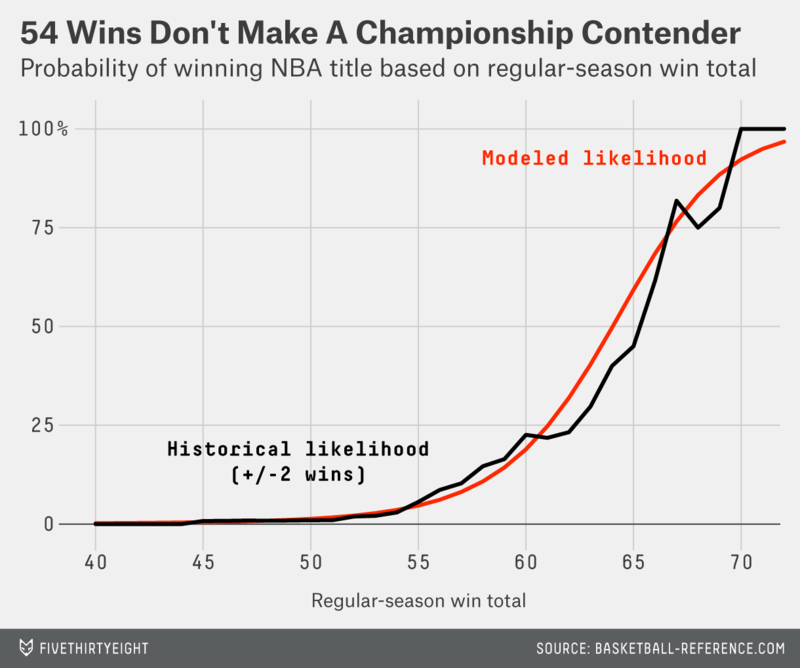 By comparison, a team with 60 regular season wins will win the title about 20 percent of the time, and a 65-win team will win the title about 60 percent of the time.